CW - what’s the allure of Morse code? I enjoy HF DXing whenever I can - around ZL dawn (sometimes) and dusk (most evenings) on the low bands (30-40-80m, with no antenna for 160m at the moment) and for the odd spare hour in the middle of the day on HF since my home office is my shack, conveniently enough. I keep an ear open (just the one) for the 10m beacons most days too. I’ve caught some good high-band openings including a solid long path run into Europe on 15m that someone kindly recorded and published on YouTube video to show off their fancy instant-reversal Steppir beam (nice!). A 15m QSO with my friend Jean 5T0JL led to a nice chat on email about HF propagation and skeds on the high bands including 12m: Jean runs 90W to a vertical and I was using 100W to a simple wire loop on 12m, so that was clearly a magic path. Travelling at close to 300 million metres per second (speed of light), John’s LP signal must have gone an extra 24,900 km (0.083 x 300,000,000 / 1000) compared to the SP signal. John is close to 8,000 km away from me, so his SP signal would have taken at least 27 milliseconds to arrive here by the most direct route. Adding 83 to 27 milliseconds gives the total delay for the LP signal of at least 110 milliseconds, representing a distance of no less than 32,900 km, which is of course 24 ,900 + 8,000 (phew!). The earth’s circumference is about 40,000 km, so either my measurements and maths are wrong, or the speed of light or Earth diameter are wrong (! ), or more likely the signal took a slightly shorter round-the-world trip than the true long path, especially if we factor-in the likely extra distance between the ground and the ionospheric layers that reflect signals. It may have cut corners along the grey line but, still, it’s close enough to LP for me. One Saturday morning in August 2011 I heard my pal Paul ZL4PW CQing on 17/CW. We worked easily enough on weak groundwaves. An hour later, I heard him CQing again, but this time with a curious multitone signal. It sounded like the normal groundwave sig - a normal sine tone - plus a slightly higher frequency signal with a raspy note: most likely an auroral reflection with a bit of Doppler shift. 10m opened to most of NA shortly afterwards, and just after lunch I was amazed to work ZD8D on 30m. Even 12m flickered briefly to life a few times. A fascinating day’s DXing! Yes, that’s right, there are 3 echoes! The first echo could have been a reflection from some sort of reflecting surface - a patch of E-layer ionization perhaps - about 9,000 km away from me, or perhaps an artifact in the transceiver or PC. The second echo delayed by 161 milliseconds had done about 48,000 km, or roughly once around the world. The third and final echo arrived back here about 300 milliseconds after the dit went out. Travelling at 300 million meters per second, I calculate it had done a 90,000 km round trip, meaning twice around the globe! Wow! I heard another triple echo on my own signal on 12m in May 2013, with the delays measured at about 70, 161 and 300 mS again. I’m puzzled why the 3rd echo wasn’t at 322 mS ... maybe it took a shortcut along a greyline ‘duct’ rather than following a true great circle path? For the record, on both occasions I was using the K3’s fabulously slick QSK+ setting, with the KPA500 running 500 watts out to a fullwave 12m wire loop antenna. It probably helps that the loop is fairly omnidirectional. By the way, QSK sounds horrible on some rig/amp combinations: for example, listen to this short soundbyte of 1A0C on 30m. This is staccato CW - the CW speed is quite high to start with but shortened CW bits turn some of the dits into blips. I measured the bit lengths on his “5NN”. While the dahs are reasonably consistent (86 and 97 milliseconds in this case), the dots vary widely between 13 and 33 ms, averaging a little under 23 ms. In conventional Morse code, a dit should be one third the length of a dah. On average, 1A0C’s dits were only one quarter of a dah (I’m being generous due to the measurement difficulties: those 13 ms dits were only one seventh of a dah!). The bits were shortened variably, most likely due to low quality QSK. The op could have counteracted this by reverting to semi-break-in or increasing the CW weighting on his keyer, or of course buying a better radio and amp, but he probably just didn’t realise. Strong echoes on SSB make it sound as if two stations are doubling when there is only one - here is a clip of ZL2JBR one morning on 20m: by chance he was beaming NW from Wellington while I was beaming SE from Hawkes Bay. After turning our beams towards each other (NE and SW respectively) we had a solid QSO on ground wave. 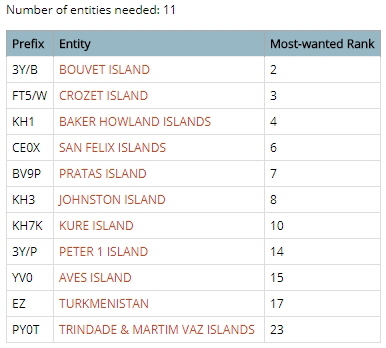 After more than a decade as ZL2iFB and ZM4G with over 100,000 QSOs in the log, I have worked and confirmed 331 all-time DXCC countries, earning mixed, CW, Phone and Data DXCCs, DXCC Challenge and single-band DXCCs on all 8 HF bands from 10m to 80m. I have worked EZ twice but neither QSO is acceptable for DXCC due to “licensing issues” in Turkmenistan. I make about 6,000 regular DXing QSOs per year as ZL2iFB, plus another few thousand contest QSOs as ZM4G, ZM4T etc. That’s about 20 QSOs on an average day - more lately on FT8 thanks to the automation that lets me multi-task, generally working while keeping an eye on a side screen for FT8. I don’t run full-auto. What’s the point? No fun in that. 97% of which (2,300) are confirmed. CQ zone 2 is surprisingly difficult from ZL. We have to battle the US and EU piles over a mostly weak and fluttery polar path. Odd, then, that we can work OX, TF and the rest of VE without too much trouble. Anyway, I relish the challenge. Wouldn’t want it to be too easy! Re WAS (Worked All States), I’ve worked ‘em all on 10 to 40m, but I’m missing South Dakota on 80m, most of the US on topband, and all of the US on 6 and 60m. I sometimes monitor the beacon frequencies on 10m during the ZL daytime while working (one of many benefits of working from home). While we had sunspots, I logged about two hundred 10m beacons, most of them running QRP to verticals. Comprehensive beacon lists are maintained by G3USF and WJ5O. It is disappointing that not all beacon keepers mention their beacons on their QRZ.com pages or publish information about their beacons elsewhere on the Internet, even the basics such as the location, power and antenna. Why they would go to the trouble of installing, running and maintaining a beacon and yet not publish this information puzzles me. I record the beacons to help ID the weak signals we often receive here in NZ. Aside from the beacon message text, the exact frequency (well, exact according to my K3’s VFO display, calibrated against WWV) and characteristics such as its strength, keying speed, timing, tone of the signal and any anomalies (e.g. does it chirp?) are often enough to ID a beacon reliably without necessarily having to wait to hear its full callsign. In the case of those annoying beacons that only send their calls infrequently, it’s a big time saver that lets me log more DX beacons while the band remains open. When the 10m band is wide open in ZL, there may be more than 50 beacons to ID and log at any one time: that hyperlink points to a 13-minute MP3 recording of me systematically tuning through the 10m beacon sub-band from about 28186 (VK5KV) to 28300kHz, (K6FRC/B) back in 2010, pausing along the way to ID and log the signals using their callsigns if I catch them or their messages or characteristic signals if not. Other DX: 5B4CY KC2VLC/6Y5 DU5I HP1AC/BCN HP1ATM/B HP1AVS/B (also heard on 30m) HP1RCP/B HP1RIS/B HP6RCP/B JE7YNQ JR0YAN/0 LU1FHH LU2DT LU2ERC/BCN LU3DBJ LU4JJ LU5FB LU8XW/B on 28190 and simultaneously on 28195 NP2SH/B PT2SSB/B PU2FDC/B(?) PY2DSB PY2RFF/B PY2WFG PY4MAB PU4CBX/B PU5ATX PU5AZA PS8RF PT9AAA/B PT9BCN/B (also on 40m) RI1ANB R1ANF V73TEN XE1FAS/B (also 30m) XE1RCS/B XE2AT/B XE2ES/B XE2O/B XE2WK/B XE3ACB XE3D/B XE3EOL/B XE3N/B XE3XOX/B YB9BWN/B YV5LIX/B ZS6DN and RS15, the ancient Russian satellite, still limping along! 6m is not the only magic band. Listen to TP2CE/B on 10m running just 450mW on the far side of the globe, and even more remarkably AC0KC/B with a measly 50mW (equivalent to a quarter of a million kilometers per watt). 50mW would barely power a very dim torchbulb, even one of those fantastic white LEDs would be pathetically weak. And this is CW, remember, copied by ear, not some fancy digital mode integrated over a period and decoded by computer. A number of fishing buoys mark drift net positions with beacon transmissions (illegally) within amateur bands. Some sit rather annoyingly in the beacon sub-bands. Most send a few seconds of carrier (which usually starts up with a chirp), then a short callsign (1-3 characters, chirpy again, chosen by the fishermen), then go silent for a minute or so. Here’s one on 10m sending C, one sending D and another sending NZ all seemingly due East of NZ, possibly floating around central America or the Caribbean, perhaps even further away. One or two come up in our afternoons when propagation swings towards VK and JA. Despite running QRP to CB-type vertical antennas, their saltwater ground plane is enough to launch the RF over thousands of km via skywave, much further than is necessary for the net-hunting fishermen who presumably have a pretty good idea from GPS as to where their nets were and I guess listen on ground wave as they approach over the final few km. The NCDXF beacons are a useful guide to worldwide HF openings on 10 thru 20m, with the benefit that you can monitor a single frequency on each band, ideally using Faros to hear when various long and short paths open, or monitor either all or just a selection of the frequencies automatically over a period to spot the openings (e.g. using Beaconsee). The NCDXF beacons are remarkably useful propagation tools. Like all 24x7 beacons, however, they inevitably suffer occasional outages and glitches, for example OA4B transmitting all its time slots on 18MHz instead of moving band-to-band, VK6RBP with ALC problems and CS3B with ALC problems and instability (and lately it seems transmitting only the tones, with no callsign/ID). Find out about planned (and unplanned!) engineering works on the official NCDXF beacon site. I urge regular users to contribute to the NCDXF to express your support for the beacon ops and help keep the beacons running. NCDXF is also a major sponsor of DXpeditions. Please avoid transmitting on the NCDXF beacon spot frequencies: 14100, 18110, 21150, 24930 and 28200 kHz, and the beacon subbbands such as 28160 to 28300 kHz. They may seem empty to you but there are usually people like me listening intently for weak beacons. Check out what the History Channel has to say about Morse code, invented by Samuel FB Morse (nice initials! ), Joseph Henry and Alfred Vail, and used for telegraphy over wired and wireless circuits since the mid-19th Century. It was used for the first ever round-the-world radio contact between stations 2SZ at Mill Hill School in London and 4AA at Shag Station near Dunedin. To commemorate the 90th anniversary of that historic QSO in 2014, the UK authorities gave special permission for 2SZ to be aired from the same school, and it was a big thrill for me to contact them during the Oceania CW contest. With modern equipment, aerials and scientific knowledge, round-the-world contacts are no longer rare ... but they are still special. I have been using CW almost exclusively since I was first licensed in 1979 and discovered that 100 watts or less goes much further on the key than on the mic. Even with QRO I still love CW, perhaps because CW is a more universal language than SSB. Nearly everything gets abbreviated - whether you're a ZL or a JA, "73" sounds and means the same thing. CW is more bandwidth-efficient than SSB (approximately 4 Hz per WPM for a well-shaped CW signal, according to K3WWP, so less than about 150Hz at normal CW speeds) and much easier to filter out QRM. Even polar flutter and auroral Doppler shift sound OK on CW. OK OK so the computer digital modes are even better still but then the computer does all the work, and since I work in IT, typing is not my idea of a fun pastime. International Morse Code, plus various procedural aspects of sending and receiving telegrams, are specified by ITU-R recommendation M.1677. If you care about CW, please pay attention to the prosigns (such as ...-.- “end of work”) that should be run together as one continuous character, not separate letters (...-.- might be remembered and written as SK or VA but should not be sent that way). I can’t see much point in learning and using the AC prosign for the @ symbol in email addresses when “AT” works perfectly well and is universally understood. Likewise “DOTCOM” or “DOTNET” or whatever are self-evident whereas the dot/period/fullstop character is not so commonly used by hams. It’s odd that KN (go ahead named station) and BK (break) are usually sent as prosigns but don’t appear on most ‘official’ lists of Morse prosigns. Maybe in theory they should be sent normally with letter spaces, but in ham usage they have evolved into prosigns. In contests, I tend to send “TU” as a prosign to save a few milliseconds, ending every QSO with an “X”. Seems appropriate to me and, so far, nobody has complained. In 2001, I joined the Voodudes’ DXpedition to Ouagadougou, Burkina Faso for the XT2DX operation in CQ WW CW. We transported the entire multi-multi station from Ghana to Burkina overland in a hired minibus and set it up on the roof of an hotel. It was a real blast - although I have plenty of contest experience, it was my first real experience of being at the DX end of a pileup. I joined the lads again in 9L a few years later. I was part of the Oceania DX Group’s VI9NI team in 2006 for CQ WPX CW. The contest was a bit of a flop but the trip was fun. The opposite happened with a short break to Rarotonga, operating as E51iFB from a fabulous holiday QTH that just didn’t work out on the radio somehow. I could hear OK but evidently couldn’t be heard, and to cap it all my laptop’s hard drive expired taking the whole E51iFB log with it. :-( It’s a good thing I didn’t make many QSOs really. Lee ZL2AL put me on to the fabulous DXpedition videos by James 9V1YC (originally on DVD, now online). The BS7H story is amazing - to see 4 self-contained stations perched on rickety wooden platforms on rocks about the size of a rug, the largest remaining bits of a dead reef still above water at high tide, in a war zone in the South China Sea, is almost incredible. They were fortunate to have such good weather as I’m sure the slightest of squalls would have been catastrophic. The “discussions” about whether DXCC rules should continue to permit such an entity rumble on. Rising sea levels due to global warming will probably result in deletions of some of these wet specks of rock before long, once they no longer poke above the sea even at low tide: perhaps then those American hams who are still in denial about climate change will finally accept the inevitable. VP8THU was a “micro-light DXpedition” using small barefoot transceivers. Given that they must have spent a fortune getting the team there, it seems odd that they would skimp on equipment and settle for poorer signals, but still they made a respectable number of QSOs. Watching them ferry people and equipment from a dinghy up an icy rock face, and back again at the end, is best done from behind the settee - a bit like the BBC’s “Dr Who”, too scary for kids to see out front. The vids are well worth watching, whether you just work DXpeditions, dream of joining one or are actually planning one for real. It’s a shame James 9V1YC doesn’t at least make a guest appearance in front of the lens though: I guess either he’s not keen on letting someone else hold his expensive camera or he’s camera shy! Gaining the respect of fellow DXers and DXpeditioners. Some DXers living in exotic places grow tired of endless rubber-stamp QSOs. 5T0JL, for example, prefers not just to swap reports but wants to find out operators’ names at least. It’s his choice: if Jean is running a pileup, it’s up to him how to run it. Always listen carefully to the operator’s instructions, and failing that take your cue from what the DX op and other callers are normally sending. Just as it is considered impolite and inconsiderate to monopolise the channel by sending a long brag file to a DX station that is running a decent rate on one of the digital modes, it is equally rude to blurt out just “five nine” or “5NN” to someone who is routinely swapping names etc. Be nice! Listen listen listen! If you hear a pileup or see something juicy spotted on DXcluster, please don’t just jump straight in. You will not be able to work the DX if you can’t even hear the DX, so first find the DX stn’s TX frequency and set up your transceiver and antenna properly while you listen to his rhythm and hopefully find out his preferred RX frequency. Take command of your pile. Be clear, fair and reasonable. Lots of DXers will be desperately calling so do your level best to work them as efficiently as possible. Adopt a consistent rhythm and sensible speed for the conditions. Ignore the lids - don’t rise to their bait. Pick out callers that synchronise with your rhythm [hint: they may not be the loudest]. using the outstanding freeware program PileupRunner by Alex VE3NEA. Note: this tip is for DXers as well as DXpeditioners. We must each appreciate the other’s needs as well as our own. Configure your rig correctly. Use the appropriate filter settings, RF gain or attenuation and so forth to have the best possible chance of completing a QSO. You might like to lock your receive VFO or pop it into a memory once it is set correctly, though you may need to make adjustments later if the DX shifts about to avoid the frequency kops. DX stations often operate with relatively low power and basic/temporary antennas, so be prepared to work at it. Find out from propagation prediction tools (such as Club Log) when you are most likely to catch the DX on different bands and plan your move. Make good use of the propagation. Listen patiently to see if they are getting stronger. Turn your beam if appropriate and maybe check the long path. If you can’t hear them well, you probably won’t get through, especially if they have a pileup. Spend a moment listening to the DX in order to pick up his pattern and style of operation. Is he working all comers or calling specific call areas/continents, working by numbers, or whatever? Is this a contest-style quick fire operation working snappy callers who only call once, or is the DX taking the time to chat to callers and work the slower ones? If the pileups get too unruly, consider calling and working, or excluding, specific areas/continents and only if absolutely necessary work by numbers. Don’t spend too long on any single area or number: cycle through the complete sequence at least once every 10 to 15 minutes. Keeping the pileup under control is an important job for you. If you are too slow, the mob will get impatient and tempers will fray. Play the game. Double-check the DX stn’s callsign. DXcluster spots from over-excited DXers often list broken (incorrect or incomplete) calls. Some are obviously broken but others look OK at first glance, until you notice an Oh instead of a zero, an L instead of a one, or a 5 instead of an S ... Do not call until you are certain who you are calling and make sure you log the DX correctly. You would not want all this hard work to go to waste, would you?! It is considered vaguely rude to ask “What’s your call?” if the DX sends his callsign often, but if you have listened patiently in the pileup for a few minutes and are still not 100% sure, go ahead and ask him to confirm what you have. Send your own call frequently , ideally during every QSO but if not at least once a minute or so. If you hear anyone sending QRZ or CL?, that usually means you are not IDing often enough, and it encourages the frequency kops. Don’t rush it: send your call slowly and carefully every so often. If it is garbled and gets listed wrongly on DXcluster, some of those calling you will log it wrong. Give your callsign in full but only once, then listen for a bit. On CW, use QSK if possible to hear instantly when the DX comes back. On phone, use recognised phonetics. Never give “last two” unless the DX is explicitly asking for it. If the path is open and the pileup is huge, giving your callsign more than once without listening just creates QRM and slows the DXer’s rate down. If the DX responds with part of your callsign missing or incorrect, give your callsign again, in full, once and listen carefully in case you are doubling with another DXer with a similar callsign to yours. If he still can’t get your callsign correctly, give it twice and listen. Sometimes it helps to s l o w d o w n a little - savour the moment, you are working DX! Repeat at least the corrected part, if not the entire call, of anyone whose call you did not send correctly the first time. Failing to do this leaves the DXer uncertain whether the QSO was completed and leads to additional but unnecessary “insurance” QSOs. Get this right and the callers will love you. Get it wrong and they will challenge your parenthood, create dQRM on the frequency and be somewhat uncomplimentary about you on DXcluster and DX reflectors. Use all available tools to focus on one caller at a time: notice their tone, rhythm, accent, strength etc. as well as their callsign. Concentrate. Use the filters and DSP if they help. Turn the beam if you can. Keep your sending speed in check, no matter how big the buzz you are getting, as accuracy comes first. Use “Farnsworth” extended inter-character gaps on CW for the slower callers, especially if they are evidently having trouble copying you. Choose the best times to call the DX. Be aware of propagation. Check the solar figures and propagation predictions (more advice further below). If conditions are poor and the path is not good right now, hold on until they improve and/or choose another band. Check any pre-announced preferred frequencies, or use previous spots as a clue. Meanwhile, keep notes for yourself and look for other DX to work - tune around because rare DX stations often come up to work DXpeditions and some look around the bands while they are on. Remember it’s always best to work and then spot DX than to see them spotted and join the pileups! Be aware of, and take advantage of, propagation making the best of short greyline openings, long paths, sporadic E, tropo etc. Listen hard for weak DX callers . If you hear or work some DX in a run of routine QSOs, put the pileup on hold for a moment and call specifically for more of the same DX to take advantage of the opportunity which may be just a brief opening. Remember: you are in charge. Avoid turning the pileup into a bun-fight by doing what you say: if you say “Standby Europe” (or “NO EU” on CW and data), studiously ignore any and all Europeans who call until you say “Europe go ahead” (or “EU NW” or “CQ EU”). Operate split. Find the DX station’s listening frequency by listening to his instructions (e.g. “Up five to ten”) and tuning around the pileup to pick out those he is working (“5NN” or “five-niner” reports are a dead giveaway). Set your transmit VFO near but not on the exact same frequency as previous callers. Try to find a clear spot in the direction he is tuning. Even if the DX is working simplex, shift your TX a bit using split or XIT. Moving as little as 50 to 100Hz up or down will help the DX resolve your signal from the brainless melee of zero-beat callers. DXing is an art, not a science. Repeatedly sending your call without any respect for the DX or other callers may get you blacklisted and is wasting everybody’s valuable time. Think about how your signal will sound at the far end, find yourself a good spot to call and call at precisely the correct moment. Use the right tempo and pace. Match the DX for speed if you can, otherwise slow down. Sometimes slowing right down will give you the edge*. If the pileup is massive, you stand a much better chance of getting through if you simply hunt for a clearer transmit frequency within the range the DX is patrolling, and call there patiently. If the DX says “up 5 to 10”, go for the 10 not the 5, or even better 7.5kHz up. Respect the rights of other users of the band, some of whom are not in the pileup. Be careful not to transmit on top of another QSO. If you have a dual-RX rig, use the 2nd RX to monitor your TX frequency to make sure it remains clear, and if not move again. Operate split - always! Tell your callers what to do: use “split” or “UP” often. Give them a clue about when and when not to call (e.g. be consistent in your use of “thanks” or “TU”). Help them discover where to call, either by saying something specific like “listening up five” or “listening two-fifty for North America” on SSB or “UP1” on CW, or being a bit more vague if you need to spread the pile out (“UP” or “DN” work fine). Be considerate to other users of the band and be extra careful if it is crowded, for example in a busy contest or if other DXpeditions are active at the same time. Don’t step on someone else’s toes by dumping your pileup on top of them - in other words, listen to your chosen RX frequency range before announcing it. Restrict your pileup’s bandspread by working within a sensible range of frequencies (e.g. spread no more than twenty kHz on SSB, no more than ten kHz on CW). Focus on callers who are precisely synchronised with you, as they are evidently hearing you OK. If their timing is way off, move swiftly along: you’re wasting time. Use narrow filters to single out specific callers. Patrol systematically through the receive range when things are quiet but be prepared to move swiftly through the range when the heat is on. Pointedly ignore the alligators, callers who interrupt QSOs or call blindly as they are certainly rude and are probably not hearing you well enough to make a QSO efficiently anyway. If you decide to warn them, avoid giving their full callsigns as that confirms you are hearing them and they will just continue. If you can, monitor your own TX frequency on the 2nd RX and if you hear anyone calling you there, send “UP” more often [but do NOT work them!!]. NOTE: even if you have published ‘preferred frequencies’, don’t stick to them slavishly. DXers will find you wherever you are. DXpeditions that have unwisely chosen and stuck to low band frequencies permanently masked by QRM in some parts of the world have missed out on QSOs and annoyed DXers unnecessarily. Clever DXpeditioners nudge their TX frequencies a few 10s of HZ to dodge the idiot dQRMers, and aim for frequencies between the round 100Hz frequencies of DXcluster spots (e.g. they might transmit on say 28010.05 or .15 rather than exactly 28010.1). Double check your rig’s frequency display and VFO settings while you transmit to make sure you are actually operating split. Accidentally or even worse deliberately transmitting on the DX stn’s frequency is a no-no, creates QRM, interrupts his rhythm and raises everyone’s blood pressure. Don’t be a frequency cop. Also, please try to contain your enthusiasm: do not shout and overdrive your rig as that will make your signal difficult or impossible to copy and will create QRM. Keep checking your ALC and compression meters and reset the mic gain where necessary! Listen carefully for other stations the DX is working and try to figure out his pattern, for instance is he working people mostly around one specific frequency, over a small range, or “randomly” across the entire pileup? Be careful not to link your VFOs. If you don’t know how this happens, or how to unlink them, read the manual or ask someone who knows. It’s a common rookie mistake, especially on the K3. On any unfamiliar rig, take a moment to figure out how to use the VFOs, split and XIT/RIT. Double-check the VFO displays and TX/RX indicators. Wait for the right moment to transmit. Please do not tail-end other QSOs or call continuously, but wait for your cue which is usually when the DX says UP. Maintain a consistent rhythm to avoid encouraging other callers to call over the top of QSOs in progress. Ignore tail-enders and, if they are really rude, silently blacklist blind callers and dQRMers, at least for a while. If the QRM is so horrendous you can only pick out a partial call, send just the partial to encourage that station to try again, hoping that others will wait. When you call, give your complete callsign just once, then listen for a moment and, if the DX has not come back to someone, call again in the same way. Everyone should be listening far more than they transmit. Listen at least as much as you transmit. Use your filters etc. to the best effect and make a special effort to pick out weak callers, whether DX or QRPers (ideally both!). If you hear a weak caller but can’t quite get his call, try again. Persist. He is probably DX, maybe QRP, and is trying hard to reach you. Take your time to make someone’s day. Listen carefully to what the DX is sending. Always send your full call. If the DX sends X? and your call does not contain an X, then just stand by for a moment: they are almost certainly not talking to you. If the DX sends W3X? (especially if they repeat it), they are almost certainly not calling K5Xsomething, and certainly not something totally unrelated such as UA9ABC or I5ABC. If you keep on transmitting regardless, you will only prolong the agony for everyone, get a bad reputation and you may even be blacklisted (in order to shut you up, some DX ops may appear to work you without actually logging the QSO: don’t take the risk!). Be nice, people. We all want to play. Repeat whatever characters of a partial call you are reasonably certain about. Try to avoid sending question mark - to lids, “?” means “Go ahead”! Focus on the specific tone and rhythm of the caller, and persist doggedly until you get his complete call. If you make a genuine mistake and nobody returns to your first or second offer, say something like “No copy, QRZ” (or “NIL QRZ” on CW) and return to normal calling. If you are reasonably certain the caller had, say, “W3X” in his call, ignore any unrelated callers: working them ‘to get them out of the way’ inadvertently encourages the pile to ignore your instructions. As a last resort, make up a fictitious full call to complete your partial, have a phantom QSO, and move along. Don’t log it though! If you send someone a report but they do not respond, two things are likely: either they cannot hear you (possibly due to QRM on your TX frequency from pileup kops and lids) or you have made a mistake with their callsign. If the station you are working responds with their callsign but does not send you a report, listen extra carefully to the callsign in case you made a mistake. Persist with them until you get their correct call and their report (which is a clue that you now have their call OK). If you are uncertain that you completed a QSO, call again straight away. If you can’t get through to confirm, check the online log if available. Avoid unnecessary duplicate QSOs on the same band and mode, unless you are really not sure that you made the QSO first time around (“insurance QSOs”). Also, do not repeat your callsign if the DX has just sent it correctly, as this sounds like you are making a correction. If you hear someone you have just worked immediately or soon after calling you again, check your log carefully, repeat their call back to them and say something like “QSL” or “You’re in the log” to confirm and complete the QSO unambiguously for them. If you made a mistake in the log, correct it, apologise and patiently confirm their full call on air. To cut down on insurance QSOs, update your online log as often as you can, at least daily if possible. Gaps in online logs, and realtime updates from places without reliable Internet connections, cause more grief than not using online logs at all! If the DX starts calling for QRPers, exotic DX or first timers, take a short break to allow them their chance. Go pour yourself a coffee or make a cup of tea. At the very least, turn off your amplifier and turn down the wick. By all means sign /QRP if your license allows this but only if you are running 5 watts or less! Play the game. The DX will return to the pile shortly so rest and be patient. If you like, spend your time checking propagation predictions to find out when would be your best chance to work them. Periodically, ask your pileup to QRX while you call specifically for DX callers, QRPers and anyone who hasn’t worked you before on any band/mode . Listen extra carefully for weak signals and ignore the alligators as best you can. Turn the beam - make the effort. If a QRPer, rare DX or first-timer gets through, you will be making someone’s day extra special and perhaps teaching those alligators a lesson in humility and operating technique (some hope!). If the DX is calling for a specific area but you are not in or near that area, QRX. The DX will most probably return to the pile shortly but give them a chance to work some real DX. This is not a hard-and-fast rule: if you are operating from a relatively rare QTH (i.e. in the top half of the most wanted lists), or if an unusual opening is in progress, it’s OK to call occasionally and briefly to let the DX know the path is open. However, moderation is the key. If the DX is clearly struggling to keep control of the pile, don’t make things even worse for them. Think first and call reluctantly, if at all, if they are not calling your area. If you find you are being monopolized by callers from a given region, it is better to ask them to wait (e.g. “NO EU” or “JA QRX”) than to call another specific region, since there may be DX callers waiting for their chance. If you hear and work some DX (such as long path Africans), ask the pile to wait while you call for more of the same (“EU QRX EU QRX AF AF AF ONLY LP”). Give the Africans a few minutes to round up their DX pals and call you. Some DX openings are very short and the DX that made it through your pile has probably been calling patiently for ages. Stick to your guns: if after saying AF ONLY you work anyone clearly not in AF, expect to be hounded by yet more rude and ignorant callers. Ignore callers who only give partial calls - they are usually cheeky queue-jumpers. If you fall for their tricks, tell them very directly to wait their turn: the rest of the pile will silently thank you for being firm and fair. Send clearly - not too fast, not too slow - and work on your timing. You stand a much better chance of getting through if you synchronize with the DX, calling him only when he is listening for new callers. Sometimes, consciously delaying your call a bit makes a big difference, as does offsetting your transmitter a few tens of Hz from most of the pile who are zero-beat on the frequency spotted on the cluster (plus or minus their uncalibrated VFOs!). Do not call blindly or out of turn. Do not send a report unless the DX is calling you and has sent your callsign correctly. Do not become a pileup kop, shouting at people on the DX station’s transmit frequency. Most of all, whatever else happens, stay cool . If you lose your temper and start disrupting the pileup or chastising other callers, you will only inflame things and slow down the rate for us all. If it all gets too much for you, take a break to cool off. Go make another cup of tea or walk the dog. The DX will most likely still be there when you come back, refreshed and ready to play. There’s more sage advice for pileup kops further below. Keep your cool! For example, if you get a partial callsign or suspect you might have made an error, persist doggedly until you are confident enough to complete and finally log the QSO. Always be as clear as possible in what you are sending e.g. send “<call> KN KN KN” or ”<call> ONLY!” to indicate that other callers apart from the person you are working should stand by, and stick to your guns . Make every effort to confirm full callsigns, or at the very least repeat the corrected suffix or prefix. If there is any doubt about someone’s callsign, immediately ask the caller to (re)confirm and wait for their response. Remember, you are in charge. Keep to a reasonable, even-tempered speed. Remain polite and gentlemanly at all times. Thank the pileup for being patient with you and following your instructions. Acknowledge them for standing by while you complete a difficult QSO. Encourage good behaviour (e.g. callers from the correct area if you are working geographically) and ignore the bad (callers from the wrong area). Never lose your temper on-air. If you lose your temper and start disrupting the pileup or chastising other callers, you will only inflame things and slow down the rate for us all. If it all gets too much for you, take a break to cool off. Go make another cup of tea or walk the dog. The DX will most likely still be there when you come back, refreshed and ready to play. Remember, everyone, this is only a hobby! Lock your RX frequency on the DX and turn off all automatic tuning (e.g. AFC and NET in MMTTY). Manually select your TX frequency, lock it or pop it in the memory and for sure don’t touch that VFO if the DX calls you! Keep to a sensible range but look for a quiet spot away from the DX stn’s TX frequency (up to 1 kHz away on PSK, probably more on RTTY) and stay put for a while. If the DX seems to drift off frequency, use the RIT on your rig to keep them in tune rather than moving your VFO or adjusting the receive frequency in software. Don’t forget to listen on your chosen TX frequency and watch the waterfall to make sure it’s still clear. Stick to the preferred band segments for each mode, especially if this is a condition of your licence. Avoid the beacon frequencies and, of course, listen first to find a clear spot. Always split. Never operate simplex. Avoid listening too close to your own TX frequency. Turn off all automatic tuning and lock your TX frequency to avoid wandering across the band. Use suitable filters to pick out individual callers. Remember your responsibility to tune within a limited range to avoid spreading the pileup out too far. If stations are clearly not hearing you well, double check that your TX frequency remains clear and don’t forget to send “UP” or “QSX 14085-6” or similar. Setup your digital mode software and macros appropriately . When calling DX in a pileup, give your own callsign two or three times and listen. It is not normally necessary to include the DX callsign in your calls. Make sure you can actually copy the DX properly and have his call correct (DXcluster is peppered with busted calls). The worst thing for callers is not knowing who got called due to QRM. Repeat a caller’s callsign at least twice and give your own callsign frequently, especially if there are other DXpeditions active at the same time. Be consistent and get into the rhythm for more efficient QSOs and to reduce out-of-turn calling. Use multi-frequency decoding software if possible e.g. $multirx$ in MMVARI. Monitor the pileup to identify who is working the DX and so where he is listening. Look for holes in the pileup in which to transmit. Stay well clear of the DX station’s frequency and respect the band limits. Use multi-frequency decoding software if possible e.g. $multirx$ in MMVARI. Monitor the pileup to identify numerous callers simultaneously. Avoid working callers too close to your TX frequency or out of band, and try not to let your pileup spread too far (no more than a few kHz please). Do not overdrive your transmitter. Apart from perhaps overheating and damaging it, your signal will probably become unreadable and create QRM for others. This is especially important if you are using AFSK with tones generated by a PC audio card. Use your rig’s transmit monitor function for a simple but crude quality check. If you have a separate receiver or a monitor scope, listen to/monitor your own data transmissions to check the levels. If not, find a local ham who is willing to help you conduct some tests. If you have trouble contacting reasonably strong stations normally, and especially if you receive reports indicating poor quality signals, check those settings again. Look out for well modulated signals and make certain your own signal is clean. Do not overdrive your transmitter and be careful not to knock the microphone or PC audio level controls once set. It pays to keep a written note of the correct settings. You should really have figured those out before you left home but small adjustments may be needed in the field: ask a local to check the quality and width of your data signal when you first set up, and act on any adverse signal reports. * Here is an illustration of some of the techniques in use. First, I stopped transmitting for a while to LISTEN in the pileup for the stations he was working, trying to figure out his listening pattern. He seemed to be working several stations at a time on or near one frequency, then spinning the dial randomly: this meant it was worth me finding someone he was working and calling him on or near that frequency rather than, say, calling in a quiet spot in the pileup. With him on the main receiver in my left ear, I tuned through the pileup on the sub-receiver in my right ear, listening hard for the tell-tale “5NN” of someone actually working him and trying to pick up his rhythm. After a couple of failed attempts, I caught a JA sending him a report and set my TX frequency right there. Next I turned down my CW sending speed to try to catch his attention - the idea being to be still sending my call while others in the pile have finished. This is the reason that stations signing /M, /P or /QRP so often get through: there’s nothing magic about the suffix, except that it takes longer to send. This trick also works well if the path is marginal or if the DX has bad QRN. As soon as he finished with the JA, at exactly the right moment , I gave my call just once and listened. He came right back with a partial call (no QRZ, just part of my call) and I immediately re-sent my full call once more and listened again. At this point we were perfectly synchronised, with no need for procedural signals such as K or over, nor the dreaded question mark that invites all the lids to call too. This time he came straight back with my full, correct callsign and report, so I sent him 5NN TU, he sent TU K4M UP back real quick and that was that, another one in the bag, thank you very much. The whole QSO including the repeats took just a few seconds but I had a broad grin on my face all evening. I listen loads more than I transmit. I listen even harder as I get closer to Honor Roll - more elephant than alligator. When calling someone or CQing, I call briefly and then listen for a reasonable interval. I don't call continuously, and I don't call at all if the DX is clearly calling someone else. If I'm not sure, I listen more and transmit reluctantly, leaving more time for others to call. See 1st bullet! I only call someone if I can copy them sufficiently well to complete a QSO. Until then, I hold back ... and listen intently. I distrust DXcluster and RBN spots and always make the effort to listen to confirm the DX callsign myself. In QSO, I send my own callsign frequently, usually on every over even when contesting or running a pileup. When things get frantic, or if someone successfully tail-ends, or if a pal who clearly knows its me calls in, I may not ID every single time ... but I try not to make anyone listening-in wait long to find out who I am. I listen on the frequency before and while transmitting (including while working split) to avoid causing interference. I never tune up on the DX frequency, in his QSX slot or on top of another QSO ... in fact, thanks to no-tune amplifiers, I don’t tune up on-air at all. I’m careful to work split whether the DX says “UP” or the pileup is clearly off frequency, and I always listen first. I use a one-button macro to configure my K3 instantly for split. When I’m operating split, I try to keep the pile quite close to my transmit frequency so that everyone can hear the pile to one side, even if I don’t send “UP” every time. I try hard not to spread my pile so far that it dominates the band and causes QR .. but I expect callers to listen first on their transmit frequencies. Hint: if I’m working a CW pile, don't zero-beat with me too accurately. Shift off-frequency a bit to make it easier for me to differentiate you from other callers. I normally run my RX filters at about 2.8kHz bandwidth and listen on the HF side of my carrier so there is a good chance I will copy you if you call on the high side. We all occasionally make mistakes but there are more than enough frequency kops out there. I certainly don't shout "UP! UP! UP!" like a demented parrot or transmit profanities because I know that will QRM other, more considerate DXers patiently listening on the side. I won't interrupt a QSO but wait patiently for a contact to end before calling in. On the very rare occasions that I tail-end to catch a friend, I send my callsign quickly, once, at precisely the right moment, and listen. I don’t send any more info than absolutely necessary. If you call me while I am still talking to someone else, I am unlikely to contact you, especially if you are so rude and inconsiderate as to call me at length or repeatedly. Please shut up, be patient and listen carefully to what I am sending. I normally end my QSOs with “SK” and I try to remember to send “QRT” or “QSY” before I leave ‘my’ frequency. If the frequency ‘belongs’ to the other station but you want to work me, you might be able to catch my attention by sliding up ~1kHz and calling me, if the frequency is clear. Before calling CQ, I normally send "QRL?" and listen, by which I mean "Is this frequency already occupied?" The anticipated response is either complete silence which I take to mean “All clear: go ahead Gary!” or else "QRL" or "Y" or "R" or "C" or whatever, indicating that the frequency is indeed busy. Hint: if you send "QRL" on my frequency without the question mark, I presume you are telling someone else (who I can't hear) that the frequency is busy , hence I will not respond. If you then start CQing, you will probably cause me QRM. Please don't omit the crucial "?" in "QRL?"!! I hold back if the DX operator calls specific geographical areas other than PAC, OC or VK/ZL, unless I’m convinced that he really means “CQ not EU” or “CQ not USA” or “CQ not JA”. It is rare to hear “CQ PACIFIC”, “CQ OC” or “CQ VK/ZL”, so much so that I normally spot anyone doing so, while I’m calling them, in the hope that other locals will join me in calling the DX. On CW, I routinely use QSK (full break-in) which works extremely well on the K3. Feel free to drop in your callsign while I am still transmitting a CQ: if I hear someone on my frequency, I will normally stop transmitting as soon as I notice them. That doesn't always work, particularly if there is QRM and QRN or if I am deafened by my own echoes, but I do my best. I will normally try to match your CW speed. Send at whatever speed you find comfortable, from 5 up to about 40 WPM (the edges of my comfort zone). I'll be happy when the speed pot on my MM3 is finally worn out! When a DX operator calls me, I repeat my callsign if he has copied it incorrectly. I persist doggedly until I am sure he has my call correct. The rest (including his report) can wait. If the moves on to the next QSO without confirming my call, I will call again because I hate being “NIL” (Not In Log). If you call me and I respond but bust your call, repeat your call until I get it right. Just be sure to listen in case I am in fact working someone else with a similar call to yours. If I send "CE3?" I am explicitly asking the station whose callsign begins with CE3 to call again. Similarly, if I send “XY” I am listening carefully for the person whose callsign contains that precise sequence of characters. If your call does not match, then QRX: you will get your turn. If you hear me sending "CE3XY CE3XY CE3XY?? KN", especially if I slow right down as well, that's a giant clue that I am rapidly losing my patience with rude out-of-turn callers and may shortly QRT to cool off and regain my composure. I hate partials. If you call me, please give your full callsign or I may pointedly ignore you. Correct identification is a legal requirement in many countries. It is inefficient and annoying to deal with the ignorant callers who repeatedly send partials at me. Life's too short for partials, except perhaps when someone has most of my call and requests a fill-in, and even then I normally repeat the missing bit once or twice and then send my full call for good measure. Outside of contests, if I hear two or more people calling me at the same time, I tend to go for the weakest ones first in the hope that they might be DX or QRP. In contests, I go for the snappiest, clearest callers in order to maximize my rate, unless I catch the feint whiff of a new multiplier. If you run QRP, it's up to you whether you sign "/QRP" (if your license allows it), simply mention your power in QSO, or don't let on until you send me your QSL card. It's not always possible, but I may turn down the wick at my end for a two-way QRP QSO although I would prefer to make the entire QSO on QRP before putting 2xQRP in my log and QSL cards. I enjoy making new friends and I’m thankful for the contacts I make. I routinely confirm all of my QSOs within hours via LoTW. I respond 100% to the cards, ClubLog OQRS and email requests I receive, although it can take me months. If you want my card, by all means ask for one during the QSO, email me or make a request on Club Log’s OQRS facility. Please email me if you feel you have been waiting too long for a requested QSL, or if a confirmation does not show up on LoTW (maybe I busted your call, or maybe I was working someone else). I respect my fellow hams and try to earn your respect. If you think I am being inconsiderate, operating badly, or ignoring legitimate callers, please email me about it, preferably with an MP3 of whatever caught your attention. We can all improve our techniques. Seriously, I welcome learning opportunities and honest feedback. Thank you for reading this far. Please encourage others by referring and ideally linking to the DX Code of Conduct from your QRZ page, your personal website, DXpedition website or other ham websites. Talk to your pals at the radio club about it. Mention DX-Code.org in DXCluster comments or on-air. Most of all, don’t let your standards decline to the level of the assorted idiots and dQRMers. Together, we can make a difference, and best of all, I know it works - check out my DXCC tally above! JARL, the Japanese national radio society, offersan award for working Japanese cities. I stumbled across this after noticing yet another JA special event station with a weird callsign sending its JCC number to strings of JA callers on 40m. Google found the JARL page listing those JCC numbers and with a bit of digging and guesswork, I found this brief page about the JCC award. The basic award requires QSLs from at least 100 of the nearly 800 current Japanese cities, ignoring the deleted cities (which I hardly dare ask about). There is a similar JCG award for working at least 100 of the 396 current guns ... not, not that kind of gun, a Japanese gun is evidently a “regional congregation of towns and districts”, not unlike the districts or parishes of G-land I guess, making this award vaguely similar to the dreaded Worked All Britain award. JARL’s main English page for all its awards is here. Notice the Bz (and Theta and Phi) dips to the negative region on the 13th and again on the 14th and 16th: these were the very periods when 10m conditions peaked for me. According to N7DF, the periods of change between Bz+ and Bz- correlate with enhanced LF conditions, while the stable Bz- periods correlate with enhanced HF conditions. ... Unfortunately, this is yet another lagging indicator that doesn’t help predict when conditions will peak. But still, it’s an interesting aside. 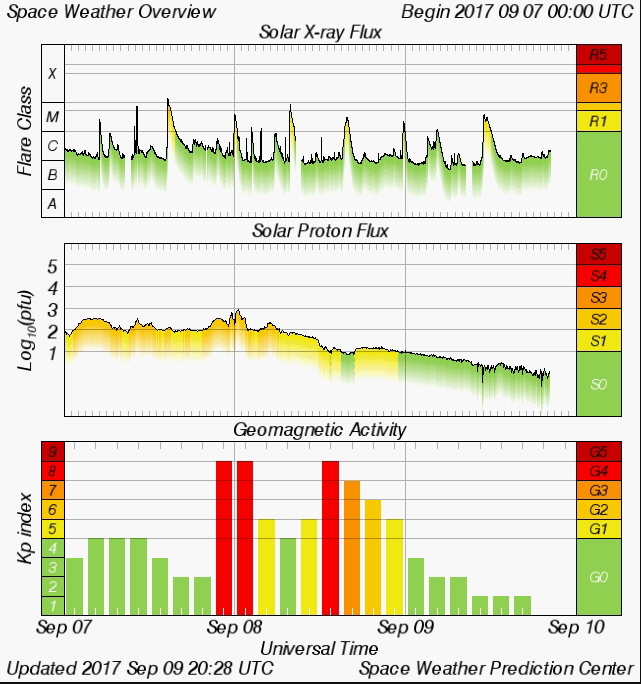 Those yellow peaks on the X-ray chart were flares, while the red, orange and yellow bars on the geomagnetic chart reflect a Coronal Mass Ejection from the sun that sent the A- index to about 100, generating auroras and all but wiping out HF propagation (and the FOC BWQP contest ) for a day or so. The few DX signals I could hear on 15, 20 and 40m were weak, and my kW evidently wasn’t enough to reach most of them on CW ... but I did contact ZG2TT on 15m using FT8 with 200 watts out to my 5 ele monobander beaming due East, receiving a -14 dB report. The plot above was a few minutes after a flare wiped out 5X0NH’s signal on 17m: both short and long path between ZL and 5X pass through the polar regions where the orange and red shading indicates significant HF absorption. Operating single-band on 15m in the 2012 WPX CW contest gave me the chance to study the way the paths change with propagation. Towards dawn and dusk, DX signals from the Far Side often appear at strange angles of azimuth (e.g. UK stations that are normally worked by beaming due North or South can be strongest to our East or West, and at other times I had some good runs while beaming at the South Pole) but the mystery is solved by looking the great circle map: the grey line between night and day snakes its way around the world giving those odd angles as it passes either end and, usually, give substantially stronger signals for a while. I’m fascinated by long path openings, not least because they offer a way to work DX stations that struggle via short path due to local terrain and QRM. It’s quite a buzz to break through a US pileup working an African station via their SP, since my LP to Africa passes over North America: all I need is for the African to hear my weak fluttery “DXey” signal as it pops up at just the right moment between the stronger US SP signals in their pileup, and for the US guys to give me a break, which mostly they do. I’m trying hard to train myself to pay more attention for LP callers in my own pileups too, so please don’t give up too easily if you are calling me on your LP though my SP pile. 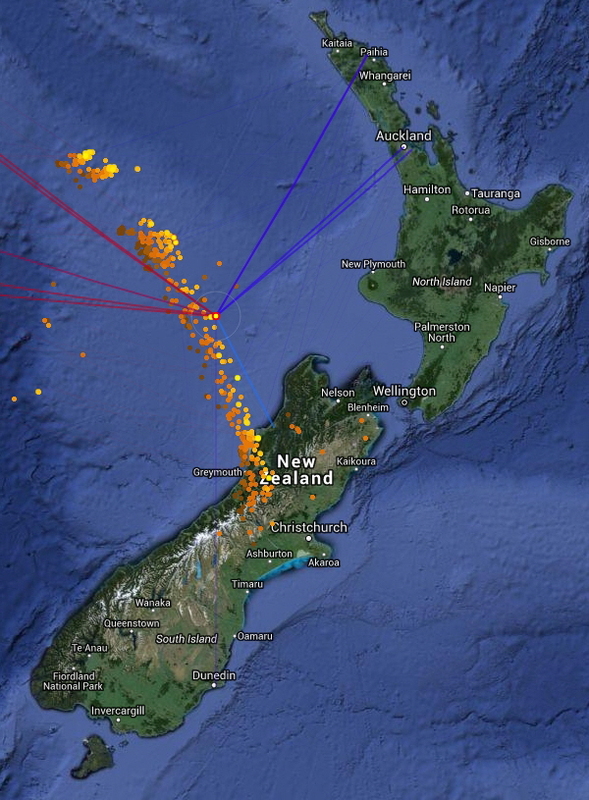 Lightning in the Tasman Sea puts the QRN crashes above S9 on 80m. Usually, the noise floor is about S5 on my loop. I’m not entirely sure why it is so high - computer noises from the shack, I guess. More investigation required. 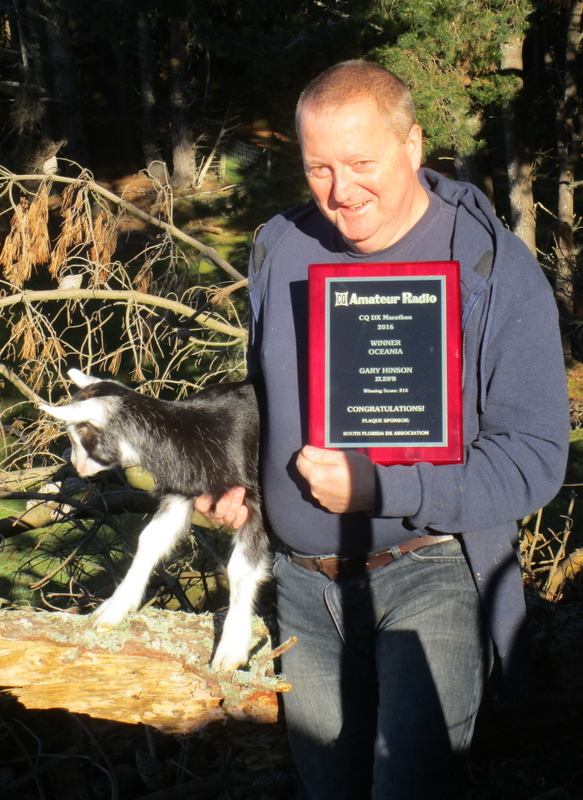 CQ Magazine's DX Marathon is a DXers’ competition to work the most DXCC countries plus extras (such as the Shetland Islands and Kosovo) and CQ zones during the calendar year. Extract and save your complete 2017 log as an ADIF file. Download the official spreadsheet from the CQ DX Marathon website and save it somewhere handy. Download the DX Marathon scoring utility by Jim AD1C (tnx Jim, what a star!). Install and run the DX Marathon utility. Enter the station info, then point it at the ADIF log from step 1 and the spreadsheet from step 2. It hunts for all the CQ zones and countries in your log and magically completes the spreadsheet for you. Check the spreadsheet manually for errors such as busted calls and zones. The notes on the DX Marathon website are very helpful, including many busted DXcluster spots (you always double-check a spotted DX station’s callsign before logging him, right?). Add some soapbox notes and save the spreadsheet. Send the spreadsheet as an email attachment to Scores@DXmarathon.com before the deadline (January 10 th ). Check the inbox for a confirmation email that the entry has been received. Take note of any feedback from the contest adjudicator such as apparently invalid claimed countries or zones (usually zone 2) and fix them if you can before the dealine. Wait patiently for the results. Logs in the running for top honours are thoroughly checked: I know because John K9CT found a ZB pirate in my 2016 log. This year’s event started on January 1st, so if you are DX, don’t be surprised if I call you on several bands having already worked you in previous years! Likewise, I’m happy for others to call me at least once per band and mode per year - well as often as you like really. If I’m not busy, let’s have a chat. If I’m running a pileup or contesting, please don’t be offended if I exchange a brief greeting and quickly return to the waiting pile. By the way, although CQ Mag offers us no way to track our performance during the year, the CDXC DX Marathon Challenge and league tables on Club Log are useful and great motivators. Easier filtering - point-n-click configuration of the DXcluster filters for bands etc. Sort spots by band, frequency etc. Read announcements, cluster mail etc. Merge spots from multiple DXclusters: connecting simultaneously to more than one DXcluster node with CC User is useful to maintain a feed even if individual cluster nodes drop out or get bogged down, and to merge spot feeds from different sources e.g. the members-only spots received from a private cluster plus general spots from a public cluster. The default list of DXclusters in CC User does not include every single one. Paul (G4BKI) maintains a comprehensive list of DXclusters accessible via Telnet. Enter your CDXC cluster login ID and password (obtained from CDXC) and optionally complete the rest of this panel with the appropriate info for your location, home node etc. Click Connect to tell CC User to make a Telnet connection to the address entered in steps 3 & 4 and then submit your username and password entered in step 8 to log you in, and that should have you connected to the CDXC cluster. Optionally set up the cluster info, band filters etc. using the Settings , Bands and other tabs in CC User then click Tell Cluster to let the new node know about them. VE7CC’s DXcluster node and CC User software has the option to deliver CW Skimmer spots from the Reverse Beacon Network. Skimmer spots show up when someone starts CQing on CW or RTTY, often before they are spotted by a human being. Personally, I like the fact that RBN spots everyone, not just “DX” - ordinary hams CQing, not just those with rare or exotic calls - so I have filled many ordinary band/mode slots for the CQ DX Marathon and caught up with non-DX friends that probably would not have been spotted, so I would otherwise have missed them unless I happened to be tuning past at the right moment. There are some disadvantages to RBN though, primarily busted spots ... but to be fair busted spots turn up on DXcluster too. Logger32 can also collate spots from two different clusters - simply connect to the respective clusters from the Telnet and Local host tabs in the cluster window. To hear really well, you need to be really really quiet. Banish switch-mode power supplies. Scrap those nasty plasma TVs and noisy CRT displays. Hunt down and eliminate computer QRM. Then, when you’ve cleaned up the neighbours, go home and re-check yours yet again.